Whipping up fresh, new content marketing ideas? Sometimes it’s HARD. It’s true. We’ve been in the content marketing biz for years, yet there are still times when we get stuck coming up with new ideas. It’s one thing to write a blog post title, but coming up with great content marketing that sells? That’s a whole other ballgame. Every piece of content must be created with purpose and meaning—so coming up with the best content marketing ideas is KEY. We’re going to let you in on our content marketing topic creation secrets—just some of the creative tactics we use to consistently win over the competition. Let’s get started. You’ll meet a lot of people, and trust us, they ALL have something to say. Listen and engage accordingly. Oftentimes, after just a little social listening, content marketing ideas will furiously flow. Learn these Twitter Chat basics to make the most of your Twitter time. Facebook Groups tend to be more personable than LinkedIn Groups, which naturally lean toward business. Try both to learn more about where your target audience hangs out most. (Hint: It really depends on your market.) Observe conversations in these groups for trends and build relationships with members. You’ll gain tons of great content marketing ideas and insights. Who are the influencers in your target market? They’re the people who (in some shape or form) have power (and thus, influence) over others. When they talk, people listen. Identify who the top influencers are in your industry and observe what they’re posting about on social media. See: Post Planner’s Quick Ways to Find Top Influencers on Twitter. Great content marketing ideas are everywhere! …but we often get too caught up in our busy lives to open our eyes and see what’s right in front of us. When you actually sit down, breathe, and take a moment to see and feel what’s around you, you just might find that inspiration has been sitting near your coffee or by that photo of your children the whole time. Take a look around you and try to see everyday objects in a new light. You’ll be surprised what sparks a fire inside the content marketing machine within you. We love reading articles online just as much as the next guy, but nothing beats reading ‘the old fashioned way’ to drum up more content marketing ideas. Make it your mission to pop open a new book at least once a month. If you don’t have time to read the entire thing, skip through and take notes on what you like. Choose popular books that resonate with your industry and audience. These books don’t even need to be new. Check out Amazon or eBay for deals on dated reading materials and see what older content marketing ideas you put a modern spin on. Since you’re now in the habit of being more observant (after reading secret #2 and secret #3), we encourage you invest in a scrapbook or grab an old shoebox to use as an ‘idea’ box. Fill your book or box with anything you find interesting that you pick up along the way. It might be an intricately designed brochure, a paper coaster from your favorite local pub, or even an old movie ticket. When you’re feeling ‘stuck,’ pull out your box or book. Bonus: As noted here on Rewire Me, collecting things we love is good for our brains and our lives. Doing so can help “build observational skills, improve organizational thinking, awaken a desire for knowledge, inspire creativity” and more. Neat. BuzzSumo – Quickly and easily research and monitor trending topics. Google Trends – Find out how often a search term is entered in relation to total search volume. Quora – Search questions to find your target audience’s specific problems. How can your products, services, or company provide the answers they seek? 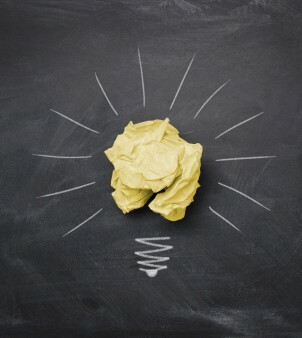 You don’t need to go crazy racking your brain for fresh content marketing ideas. Inspiration is right around you (and often free of charge). Coming up with great content marketing ideas on the fly starts with being more observant. You might just be amazed at what you’ll discover! Stop banging on the front door of your customer’s mind …when the side door is wide open! Want to learn more about effective content marketing? Whether you decide to outsource content marketing or not, this eBook is chock-full of great information on content marketing. Download this FREE guide, Side Door Thinking, to discover how content marketing can help you ramp up your website and complete your marketing strategy.